Description: we made carving by handmade leather. we also make custom made carving leather bags. There are 3 section in the bag. Size: 12inch x 14 inch. Shoulder strap is adjustable. custom sizes are also available. Owing to our expertise, we are engaged in the manufacture and export of premium-qualityLeather Handmade Bag. They are fabricated using superior-quality leather which is completely pure. They are extremely sturdy and are designed in accordance with the latest fashion trends and developments. They are available to clients in plain as well as patterned varieties. 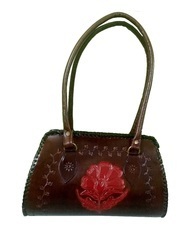 The patterns are carved onto the bag by hand and can be customized as per the client’s desires. They contain three spacious compartments for efficient storage of items inside. Different compartments are provided for the storage of pens, cell-phones etc. The zipper is rust-resistant and does not get stuck. These bags are available to clients in different colors, sizes and designs at affordable rates. The length of the handle can be easily adjusted as per the client’s comfort level. Looking for Carving Leather Bags ?